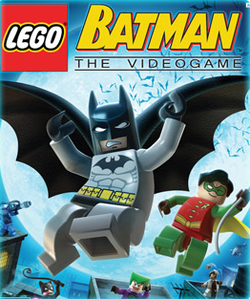 LEGO Batman: The Videogame is a video game developed by Traveller's Tales that was released on September 23, 2008. The Mac OS X version of the game was released in April 2009 by Feral Interactive. After each level, players can earn Extras by collecting a Red Power Brick. 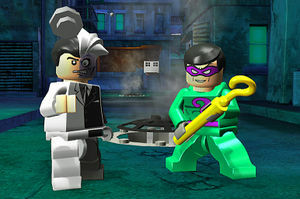 Characters such as Batman, Robin, The Joker, Catwoman, The Penguin, and Bane released in the toy range as well as new characters that are not in the LEGO Batman sets are added as well such as Batgirl, Mad Hatter, Clayface, Man-Bat, and Killer Moth are playable. Batman starts in his standard black and grey suit and can wear a Heat Protection Suit, a Sonic Suit, a Glide Suit, and a Demolition Suit. Robin can wear a Tech Suit, a Water Suit, an Attract Suit, and a Magnetic Suit. When you find those suits, you may obtain them in the Suit Swappers, or play as them in free-play. Batgirl can wear the same suits as Batman, and Nightwing can wear the same suits as Robin. 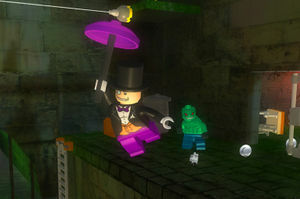 As in the previous LEGO games (such as LEGO Star Wars and LEGO Indiana Jones), once a player completes a level, that level is unlocked in "Free-play Mode". Free-play mode allows the player to replay any level they've completed with any characters they've unlocked, unlike Story Mode, which only allows players to switch between the characters involved in that scene. This permits access to areas containing extras the player was unable to get before. A sequel, LEGO Batman 2: DC Super Heroes, was released on June 19th, 2012. It revolves around The Joker and Lex Luthor teaming up, and in turn Batman and Robin ally with Justice League members such as Superman, Wonder Woman, and Green Lantern. Fifteen of Batman's enemies escape from Arkham Asylum and divide into three teams led by The Riddler, The Penguin, and The Joker. The Riddler formulates a plan to rob the Gotham City Gold Reserves and briefs his team on the items they will need to do so. He and Clayface travel through a parking garage and then through the city to a bank, where they blow-off the front and Riddler takes a giant key. Clayface, however, is enamored by the gold and remains. When Batman and Robin arrive, Clayface is defeated and Riddler is chased by Batman until Clayface trips him and Two-Face arrived in his van to rescue Riddler. Unbeknownst to either of them, Batman planted a homing device on the van. Riddler recruits Mr. Freeze to steal a freeze ray from Freeze's old ice cream factory, which they do so. While Riddler wheels the ray away, Mr. Freeze frees the Freeze Girl's from their cryogenic cases and uses them to assault the Dynamic Duo when they arrive. Mr. Freeze and the Freeze Girls were defeated, and Two-Face arrived to pick-up Riddler. Batman and Robin chased Riddler and Two-Face's van in the Batmobile and Batcycle, and the van was destroyed. The villains split-up, and Riddler was cornered at the Gotham City Police Department, but was rescued by Poison Ivy. Riddler and Ivy made their way to the Botanic Gardens where they stole mutant vine seeds, but Ivy remained as she was happy with all of the plants. She made a stand against Batman and Robin, but was defeated like her predecessors. Riddler and Two-Face broke into WayneTech and escaped with their Super-laser. Meanwhile, in the Batcave, Batman, Robin, and Alfred solved Riddler's riddles he had been leaving at each of the crime scenes and realized he was going to rob the gold reserves. Riddler and Two-Face froze over the waterway to reach the island the reserves were held on and used the vine seeds to scale the cliff. When the aimed the super laser at the door, it reflected and destroyed the laser. Using a mind-controlled police helicopter, they gained entry and made their way to the vault with the giant key. When they reached the Gold Reserves, the Dynamic Duo already found it under siege. Entering through a window, they found Two-Face had covered a floor in toxins to prevent their advancement. Robin created a swamp boat to cross using his attract suit, and they fought Two-Face until he fled. In the gold vault, they defeated Two-Face and Riddler used the vault's defense laser, but it was destroyed and he attacked them himself or would mind control the whimpering Two-Face until they both fell back into a pile of gold bars. They were sent back to Arkham Asylum with cells next to Clayface, Mr. Freeze, and Poison Ivy where they were all strangely content, except for Riddler. Penguin assembles his team for a meeting on a submarine, which includes three of Batman's strongest enemies-Man-Bat, Killer Croc, and Bane- as well as himself and Catwoman. He introduces to them the Penguin Minions and how they could use them to takeover Gotham City, but they need a special satellite and the Gotham Diamond to power it. 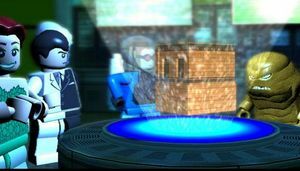 The villains placed boxes over the city in areas such as Commissioner Gordon's office and near the Fishmonger's truck. Bane and Penguin leave for the docks where the steal the satellite and place it on Penguin's submarine. Penguin leave Bane who is surrounded by Police Officers and becomes enraged. He threw a Police Car into the air, and it lands on him, bringing his own defeat. Penguin and Catwoman travel by rooftop and destroy a Police Helicopter before they enter the museum. They steal the Gotham Diamond, but Catwoman refuses to give it to The Penguin. Before he could convince her, Police Officers arrived and they split-up and were separated. While Batman and Robin chased Catwoman, Penguin and Killer Croc escaped through the docks on their water vehicles. Catwoman was cornered and threw the diamond off of the rooftop where her cat, Isis, below took it. Catwoman was taken into custody under the Police Station. Shortly after, the Dynamic Duo found Croc and Penguin trying to escape through the docs. They chased them in the Batboat and on Robin's Jet-ski until Penguin's submarine was destroyed. Croc and Penguin tried to escape through the sewer, but were cornered. Croc attacked Robin, and they escaped. They made their way to the Police Station through the sewage system to rescue Catwoman (since Isis had brought her the diamond) and Croc convinced her to give the diamond to Penguin. As Catwoman and Penguin fled with the diamond, Croc covered their flight as Batman and Robin arrived. Croc was defeated and dropped a pamphlet for the City Zoo, revealing where Penguin and Catwoman were headed. When they realized the Dynamic Duo had found where they were headed, Penguin and Catwoman fled to the Arctic World where they would set up the satellite while Man-Bat slowed the duo down. Man-Bat was wrapped in his own wings and subdued by Batman and Robin, but not before the satellite was powered and the Penguin Minions attacked the city. Making their way through the Arctic World, the duo fought the minions and the returned Freeze Girls. By rerouting the Penguin Bombers in the villains' base, they stopped the satellite and the Penguin Minions became immobile. Penguin, Catwoman, and the Freeze Girls attacked, but were defeated. Back at Arkham Asylum, Penguin and Catwoman were placed in their cells next to Bane, Killer Croc, and Man-Bat. Joker plans to spread laughing gas over Gotham City from the Cathedral, but also wants to cause mayhem for Batman. He sends Mad Hatter to Ace Chemicals to retrieve toxins while he and Harley Quinn set a trap for Commissioner Gordon. Hatter was defeated by Batman and Robin, and Gordon captured by Harley and Joker. Joker sent Batman a transmission of what they were planning to do to Gordon if Batman didn't arrive to rescue him. Reaching the Amusement Mile, Batman and Robin made their way to rescue Gordon where they also defeated Harley Quinn. Joker, however, escaped in his helicopter. While the Dynamic Duo tried to chase his helicopter down, The Scarecrow arrived in his Bi-plane to try and send them "...tumbling to the ground." However, the bi-plane was shot down and crashed into Joker's helicopter. Both villains were left for dead, but they escaped with giant balloons and crashed through the Art Gallery's skylight. They tried to escape, but Scarecrow was grabbed by a Police Officer in a crane. Joker escaped by using his laughing gas on a police man. Killer Moth met Joker outside, and together they made their way to the Cathedral. However, an enraged Gordon ordered three mobile police headquarters to stop them. They defeated them all in the clown walker, and rescued Harley Quinn. Gordon called for Batman's help, and he quickly arrived in the Batwing. With the searchlight on, Moth was attracted to the light and stayed while Joker and Harley made their way to the cathedral. Moth realized the danger he was in and fled, but Batman and Robin chased him through the streets until he was cornered and left unconscious. When he came around, Robin threatened him with bug-repellent and he told them Joker's plans. At the Cathedral, the Dynamic Duo chased Harley to the top of the tower where she and Joker and hid in giant bells. Once they were found, Joker summoned his helicopter to defeat Batman and Robin, but it was destroyed. The platform Harley and Joker were on collapsed, and Harley was knocked unconscious. 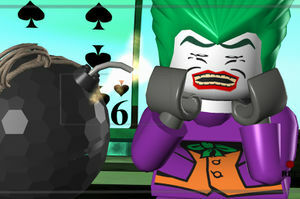 During the fight with Joker, the Clown Price of Crime managed to win and used his joy buzzer to defeat the Dynamic Duo. By the time Batman came around, Harley was already revived. He threw a batarang at the bells to disrupt the bats' echolocation and they attacked the villains. Robin awoke and Gordon arrived shortly thereafter to arrest them. They were placed in their cells next to Mad Hatter, Scarecrow, and Killer Moth. Batman and Robin scale the side of Arkham, and Joker looks up at them and shakes his fist in anger. At the top, the Dynamic Duo see the Bat-signal shine, aim their grapple guns, and move towards it. LEGO Batman is set in it's own universe, but takes inspiration from movies, comics, and the DC Animated Universe. Important events such as Knightfall, where Bane breaks Batman's back and Azrael takes over for a short period of time, and No Man's Land where Gotham has been ravaged by an Earthquake are alluded to, but others such as The Killing Joke are omitted as Barbara Gordon is still ambulatory and operating as Batgirl. However, Joker has the tropical costume he wore in The Killing Joke. The origins of the characters are either based on comic book versions, such as Mad Hatter and both versions of Clayface, while others, like Mr. Freeze, are more inspired by Batman: The Animated Series. Note: Does not appear on DS versions of the game. He is replaced with below. ♣ indicates a character who only appears on DS versions of the game. In the 2013 set 76001 The Bat vs. Bane: Tumbler Chase, a code came in every box that could be entered online for a free PC downloadable copy of the game. The offer is valid until December 21, 2014. Joker Cards are collectible cards on the game for Nintendo DS. There are 30 cards for each of the 30 levels. Below is the list of the things on the cards in order. The Extra "Extra Toggle" has no effect. Several Non-Playable characters that do not appear in the game are able to be built on Customization. Several characters like "Ventriloquist and Scarface", "Huntress", "Dr. Arkham", and "Talia al Ghul" are mentioned in the "Info", though they do not appear in the game (except the DS versions). This game has the smallest character selection chart of all the LEGO games created by TT Games. This was the first LEGO game by TT Games to feature a soundtrack by a composer other than John Williams. This game features music composed by Danny Elfman from the two Tim Burton films Batman and Batman Returns. John Williams has music featured in all LEGO Star Wars games and both LEGO Indiana Jones games. The last data that is purchased reads "The End?" which foreshadows the sequel. In the opening cut-scene for the second level of Power-crazed Penguin, after Catwoman is captured, rather than point at The Penguin and Killer Croc in their respective vehicles, a Police Officer points out two other Police Officers riding two speed-boats identical to Killer Croc's. In the DS version, in the opening cutscene to The Joker's hero story, one of the guards is playing a real Nintendo DS. The achievements "Eat floor...High fiber", "Gentlemen, start your screaming", and "Cobblepot School of Driving" are all references to the movie Batman Returns. When the player enters "An Enterprising Theft" in two-player mode, the player can enter the third room with an exit guarded by a laser field, and tech panel robot next to it. If the robot is not built and one player stands still while the other can walk normally through the laser field with no harm. However the other player will proceed to explode profoundly, and will not stop until the other exits the lasers. Afterwards the tech robot can be built and taken further through the level. Once the player enters the Arkham Asylum hub, they can wait in the main room next to the computer until another taggable super-villain enters. While one player pulls the switch and the other tags rapidly, occasionally a super-villain will enter the the Batcave. After passing the Arkham Asylum bonus, two hero characters will appear in the villain hub. In LEGO Batman: The Video Game, after the "Slam" upgrade is purchased, a glitch prevents Batgirl from being able to smack down on enemies while in the glide suit. If the player has the Decoy Upgrade for Robin and Nightwing purchased and lies down a Decoy on the edge of a pit and hits it constantly, the Decoy will fall down the pit, there soon there will be an explosion where it was put down. A very rare glitch can cause Killer Moth to appear in the Batcave's Trophy Room although he cannot be tagged and does not move. The next time you visit the trophy room, he disappears. If Mr. Freeze freezes a player while they are pulling down a switch, if done at the right time, will activate the switch but not do anything. Many times, in the Scarecrow biplane level of villain levels, when you hit the big gun that shoots rockets at the boss (the police helicopter), it will sometimes glitch and keep shooting at it so you can't do anything. Batman, a Joker Goon, and four Penguin Goons. Batman and Robin on a tightrope obove Riddler Goons. Facts about "LEGO Batman: The Videogame"
This page was last edited on 26 April 2017, at 01:05.